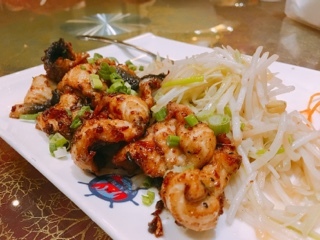 When your restaurant’s named Fishman Wharf Seafood, there shouldn’t be customers wandering in hoping to get an amazing sweet and sour pork or sizzling beef plate. 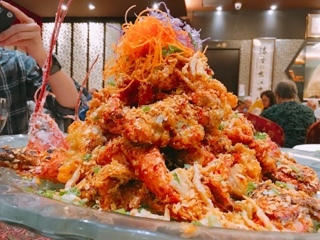 Indeed, the establishment’s focus is seafood, but in particular, Alaska king crab, which was a bit of a letdown as I really had a hankering for a lobster tower, without the added expense of the crab, and there little options for the tower without the aforementioned crab royalty. 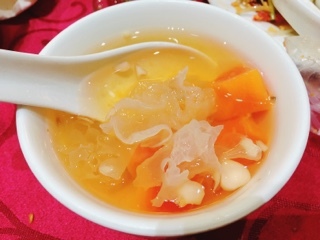 Moreover, many set meals also includes shark fin and when asked if they can substitute it with something (perhaps crab meat?) the answer is no, but they can serve it on the side so those who would rather not have it can have their rice plain. Substitutions are definitely not encouraged. You really need a group of at least six people to fully enjoy the restaurant – if you can round up a table of ten, even better. They’re known for their set meals and do offer a la carte dishes, but a tower can easily cost $100 on its own, so purchasing everything piece meal is definitely an expensive choice. Also, the restaurant assumes everyone at the table is a hungry teenager as our lobster seafood set for six ($258) was more than sufficient for seven of us; if we didn’t stuff our faces, the dinner could have even accommodated an eighth, despite the waitress urging us to add on a chicken. 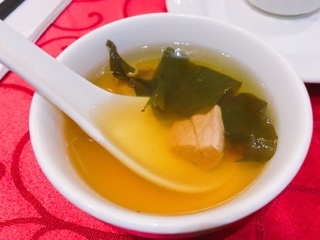 The soup and dessert are the slow boiled varieties, both not overly exciting – pork with leafy dried vegetables for the soup and a papaya with white fungus for dessert - but at least flavourful and hot enough. 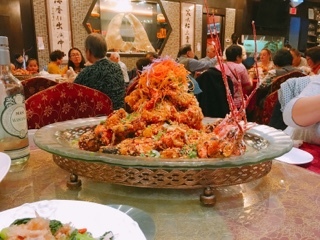 What I was there for was the eight pound lobster tower, for an extra $10 we changed the preparation ‘fried garlic’ to ‘Hong Kong style’ having heard it’s much tastier. The later still had tons of garlic, but also incorporated deep fried small whitebait fish and a bit of spice. Overall, a decent dish: the lobster not overdone, enough flavour without completely overpowering the seafood itself, and piping hot. 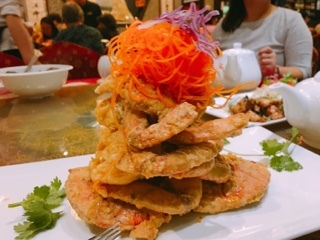 With a salted egg yolk batter covering the deep fried Vancouver crab, it’s different. At first almost offending, the oily powdery crust grew on me and the rich yolk contrasted well against the sweet crab – not unlike a less salty sharp cheese with seafood. 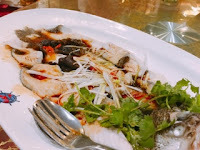 Despite being named deep fried eel, the ingredient likely only underwent a quick flash fry and then was stir fried with chilies and green onion. Normally, the eel has a gamier taste, but the stronger sauce helped mask this and was a tasty sauce. 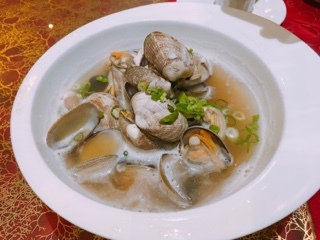 Although the clam cooked in wine was rather plain (generally I prefer them stir fried with black bean sauce), after all the heavier deep fried dishes, it was nice to eat a less oily one. It’s a shame you can’t really sip the cooking broth – unless you like the taste of pungent Chinese cooking wine. The steamed grouper was done in the “traditional” method with Chinese wolfberries (adds a light sour element) and black fungus. Also executed affably, but could use a little more soy sauce. 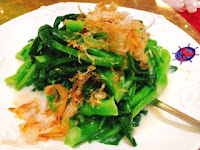 Even Fishman’s vegetables incorporate seafood, the boiled yu choy incorporating slivers of dried cuttlefish (?) on top. It’s fine, but didn’t actually help enhance the dish. To end, a large platter of shark fin fried rice. 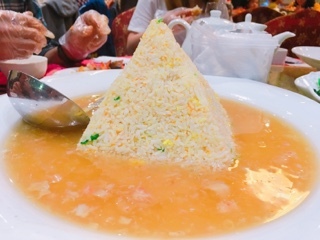 It wasn’t what I expected - a pyramid of fried rice in a pool of crab meat laced shark fin soup. Despite being morally against the shark fin, I have to admit the dish was delicious. However, with so many other elements, the shark fin really isn’t required; personally, I believe slivers of the spongy soft and crunchy bamboo innards (or jook sun) would be even better with the rice. Some things to keep in mind: they take reservations but only for large groups and payment is debit or cash only… not abnormal for Chinese establishments. After the meal, I certainly felt I had my fill of seafood. Lobster, crab, eel, clams and fish … satisfied.